Editor's Note: CMA responses were a joint effort between Tim Phillips, vice president of marketing and operations, and Valentino Faraone III, product development manager for North America. Trucks help keep the economy moving, transporting 70% of domestic freight. In 2016 alone, trucks traveled more than 450.4 billion miles across the United States. On a truck, the drive axle is what keeps the vehicle in motion. Designed to operate in a variety of conditions, drive tires are engineered specifically to turn torque into traction. With eight tires (four if the fleet is using super singles) in this position, the drive axle tire is an important investment for a fleet. Tire dealers who want to help keep fleets rolling down the road need to be well versed in taking care of this investment. Drive tires are engineered with different construction features, tread design and compounding based on application. Most drive tires feature an aggressive tread pattern, with larger lugs to help the tire get traction while operating on pavement, gravel, dirt, mud or snow. Drive tires also tend to have a deeper tread than steer or trailer tires, on average between 26-32/32nds tread depth. Drive tires can be designed with a closed or open shoulder. Each construction feature offers its own benefits. One benefit of a closed shoulder is better fuel economy. “Friction from the road surface is what causes a tire to wear. The more stable the tread surface is when it comes in contact with the road the less friction that is created and therefore less wear. The ribs on the outside shoulders of closed-shoulder drive tires keep the tread surface more compact and stable when the face of the tread comes in contact with the road, which again leads to a slower wear rate and also better fuel economy,” shares China Manufacturers Alliance (CMA), which sells Double Coin tires. An open shoulder construction on the other hand leads to better traction. “Sometimes traction is a need that outweighs all other factors. If that is the case then an open shoulder drive is better for the user. Open shoulder tires may not wear longer for the reasons discussed above, but the increased friction and better evacuation of mud, water, snow, etc., may be the primary need for a user and, if that is the case, then an open shoulder tire is the better choice,” CMA representatives add. When considering what tire is right for a fleet customer, tire dealers should consider application and environment. “For long haul tires, there is a focus on moderate to high removal miles with fuel-efficient tread compounds, coupled with casing durability for retreading. Regional haul tires are primarily focused on mileage, scrub resistance, and casing durability. With on/off road tires, the primary construction is designed to enhance durability, as well as mileage and retreadability,” says Johnny Cape, senior product manager for commercial vehicle at Continental Tire the Americas. “Tread pattern must also be considered by the application but can also be related to the environment. Trucks operating in the Snowbelt need a different tread pattern than trucks operating in the Sunbelt. The more traction needed, typically the more void you would see in the tread pattern. The trade-off here is more void gives better traction, but with less rubber in the footprint to support the load it will wear faster,” shares Rick Phillips, vice president of sales for Triangle Tire USA. Manufacturers recommend testing different tires and patterns with fleets to help them find the best tire match. Some fleets may be seeking the best fuel economy, while others may be looking for scrub resistance. Tires are the third largest expense for fleets. 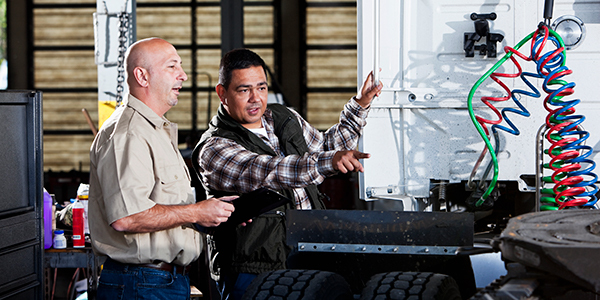 To help cut down on tire costs, fleets rely on retreading. A drive tire can be retreaded several times if properly maintained. Tire manufacturers offer varying warranties for their tire casings, but most guarantee three retreads. For the best opportunity to retread a tire, many fleets pull drive tires before their legal limit of 2/32nd of tread depth. “It seem the general agreement is a drive tire should be pulled between 4/32 and 6/32 to protect the carcass so it can be retreaded. Running the tire down to 2/32 increases the risk of damage to the crown area from penetrations, stone drilling, etc.,” CMA shares. “What we see most fleets doing is pulling the tires earlier than [required by law]. The reason being is if you get some irregular wear or get something happening to that tire at that lower tread depth, you can damage the casing. And when you damage the casing you lose the retread,” Bridgestone’s Palmer agrees. It’s important to note however, that with an influx on cheaper entry-level tires, some fleets are opting not to retread, CMA says. In order to be the best partner to fleets, tire dealers must educate and service their customers. “The premier dealers in the market are the ones that go above and beyond just dropping off tires and retreads. They educate their people on how to save fleets money. They are very proactive in understanding the needs of the fleet and then assisting them in setting up a good maintenance program. Most major mega fleets have good maintenance programs, but a lot of the mid-size and smaller fleets need help, and the servicing dealer can be a valuable asset to the fleet,” says Triangle’s Phillips. A key component of tire maintenance is checking tire pressure. Underinflation and over inflation can both be issues on drive tires. “Tire dealers can perform regular fleet inspections to assist customers in regulating proper inflation targets – improper tire inflation is one of the primary causes of irregular wear leading to premature tire removal. A tire that is just 10% underinflated means a 1% decrease in fuel efficiency and 15% shorter tread life,” Conti’s Cape adds. When checking tire pressure, it’s also important to pay close attention to the inner tire on a dual drive fitment. “It’s a well-known issue that the inside tire in a dual drive fitment can exhibit low pressure without being noticed. Many drivers and maintenance personnel miss checking the inflation pressures on inside dual assemblies due to the difficulty of locating the air valve. Due to this lack of maintenance, variations in inflation pressures between inside and outside dual assembly tires can cause irregular wear, which then sometimes leads to early tire removal,” Cape says. Tire maintenance programs should include not only regular tire pressure and tread depth checks, but tire rotations as well. “Tire rotation is very important, especially with newer trucks only having torque to one axle which causes those four tires to wear 30% faster or more than the tires on the free rolling axle. Simply rotating every 50K miles can significantly increase the overall longevity of a set of drive tires,” CMA says.